Aerial Deep Stretch is a gentle routine to gradually open up the body and safely progress into more advanced stretches. Using the hammocks to work against the force of gravity allows us to effectively decompress the joints and deeply stretch the muscle fibres. Deep breathing facilitates the release of tension and toxins built up with training and stress, which prevents our body from expressing its natural flexibility. You will find yourself in positions you never thought possible! You will also learn new breathing and stretching techniques and how to work while suspended in a hammock. 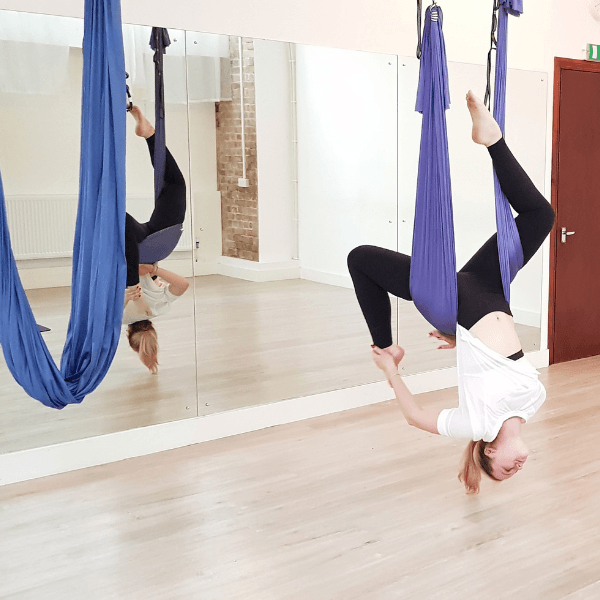 Suitable for complete beginners as well as anyone used to antigravity or aerial yoga or deep stretching. You will learn to challenge yourself to improve your flexibility without pressure. Please wear leggings and a T-shirt that covers your underarms – this is very important! Also, please remove jewellery before the class, including watches, bracelets, necklaces or hoop/long earrings and do not wear any clothing containing zippers, as these will damage the hammock fabric.